Short report. I took a week off while my boat had some minor work done to the tilt/trim unit, now it’s ready to go for a long fall season. I did manage to get out today for some white perch fishing on the Choptank River. Mid-day, bright sun, low tide, dirty water and still managed to catch about 40 perch in a couple hours of fishing. Nothing real big but a blast on light tackle. Cast Beetle-Spin lures of 1/8th ounce did the trick. This is a lot of fun and they should be even bigger with better water conditions. Caught a couple YOY rockfish of around eight inches as well. Good to see those guys. Three trips between now and Saturday so it’s back to stripers, blues and maybe some spanish macks. I think Saturday’s trip starts off with the perch so it looks like I’ll start the day off with some fast action. Hope to have a great report for you all next week. 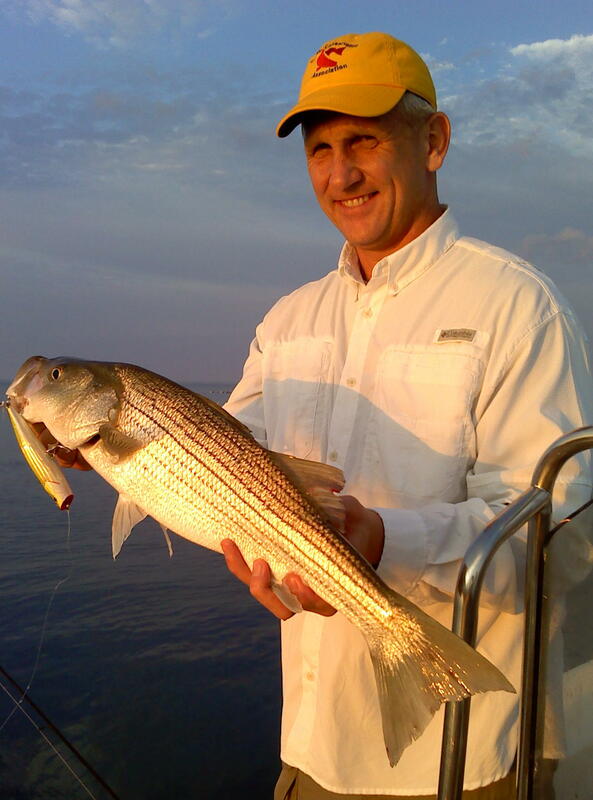 Topwater rockfish is still going strong and next Monday and Tuesday are the last two days for the six hour summer rates. If you would like to take advantage of some fun fishing let me know soon! First, I want to tell you about an evening trip I had last Tuesday with good friend and long-time client Bernie Kemp and his two sons Matt and Aaron. We fished out of Crisfield with the hope for some nice sized blues followed up by rockfish on poppers. The afternoon started-off breezy and only got worse as the day went on. With conditions too bad to look for breaking fish, we worked our way to the Tangier Target ship hoping to find some bluefish action before it really got bad. We did find the blues, though not as big as I had hoped but still fun on light tackle. Matt seemed to have a knack hooking the blues with Aaron a close second. 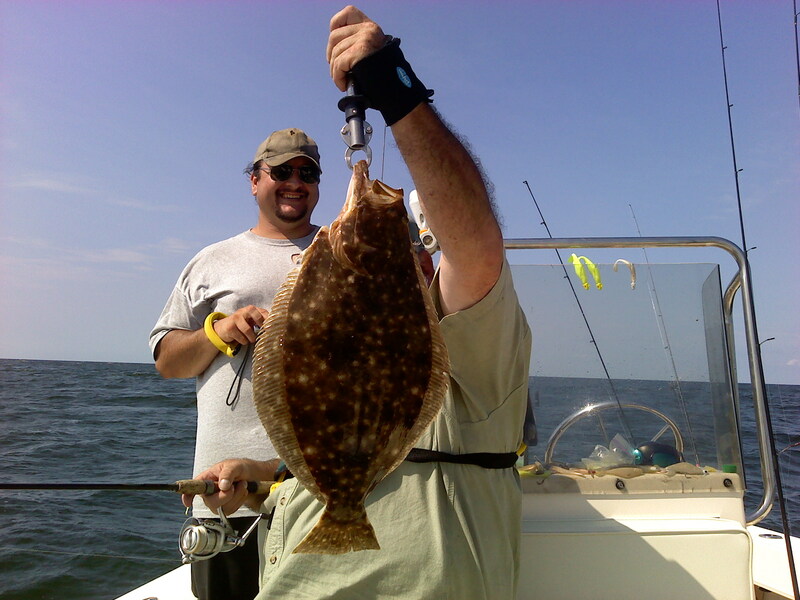 In addition, Bernie surprised us by twice bringing in two very nice flounder in the 21″ range. Bernie was a little camera shy but not the flounder..
After the action slowed and the wind picked up even more we decided to head for shallow water and try for some rockfish. Too choppy for poppers, the guys managed to catch some nice school stripers and Aaron snagged a hard fighter of about 24″. Nice fish Aaron. Considering the windy conditions and cloudy water the Kemp family did very well and all had a great time. The Jones Brothers gave us a safe, smooth, and mostly dry ride back to Crisfield. 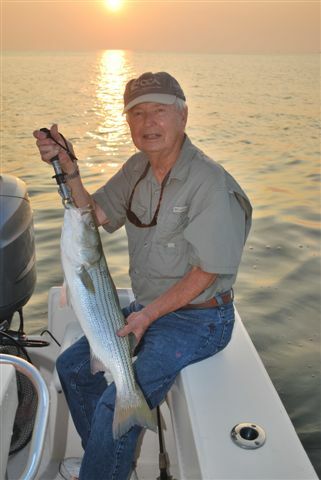 I fished Saturday morning with long-time client and good friend Gary Beard. We met early at 5:30 A.M. at the Somers Cove ramp in Crisfield, and what a beautiful morning it was. Slick cam, as the local say, with hardly a breath of air moving. After a brisk ride to the fishing grounds (does brisk fit this time of the year? ), we found perfect popper conditions. Almost immediately Gary was watching stripers climb all over his Stillwater Smack-it! 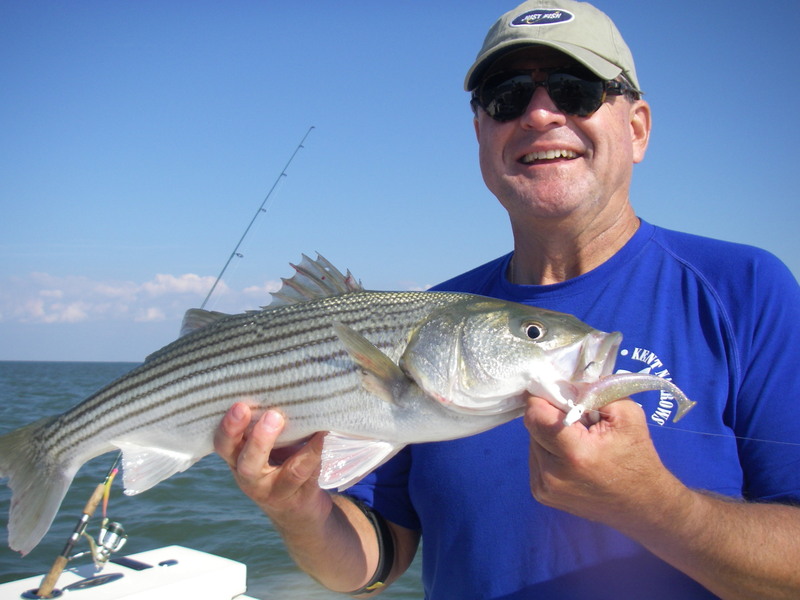 In fact, his very first fish turned out to be two, a rockfish on each hook – a first for Gary! For the next two hours Gary had blowup after blowup from hungry rockfish, one or two fish even came clear of the water to attack his popper. It was a great topwater display and another first for Gary with shallow water rock fishing. While we had a couple of fish that looked to be approaching 30″ pull the hook, Gary still managed to land several in the 25″ to 27″ range. 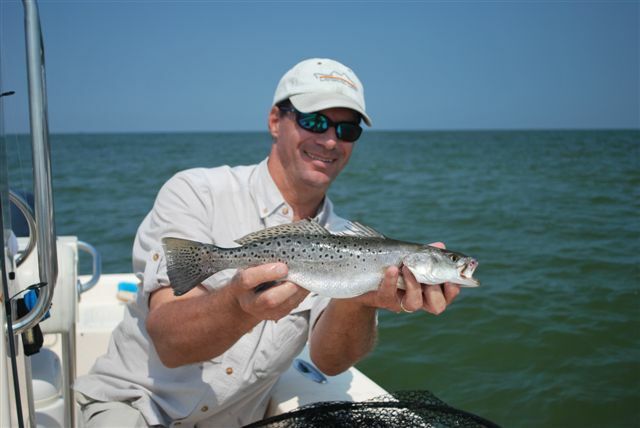 On the way back through Smith Island we made a stop or two and Gary landed a 16″ speck, the first of the year for us both. Wow! am I glad to get that skunk out of the boat! Thanks Gary..
As it stands now, my next few trips I’ll be playing around the Little and Big Choptank rivers. Fishing was terrific when I last fished there two weeks ago so I look for some good things to happen. I still have a few good dates available before the August rates are up, so shoot me an email if interested fishing has been great! I had a fairly busy week since my last report and some nice weather for a change. I hope the 100 degree days are behind us. 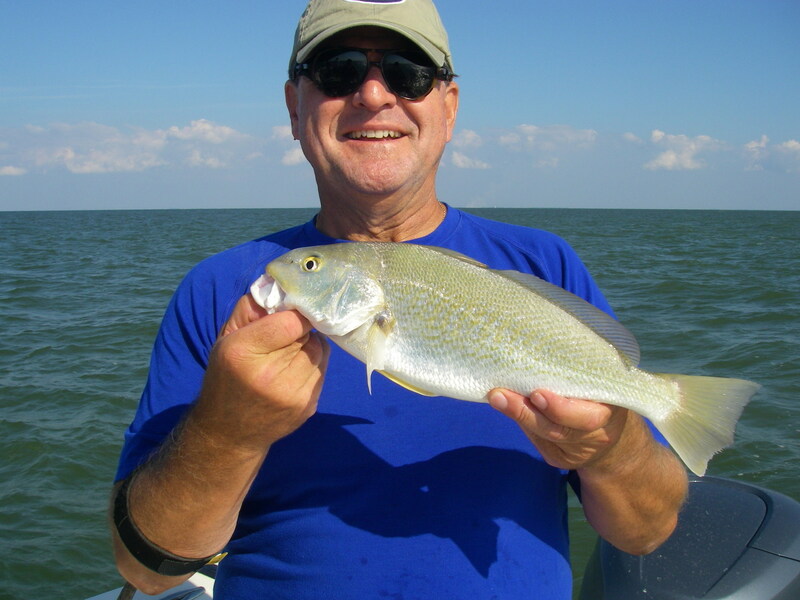 Fishing both the mid-bay out of the Little Choptank along with Tangier Sound out of Crisfield brought some outstanding catches, especially considering the heat of this summer. The water temperature at the mouth of the Little Choptank on Monday was 86 degrees – yikes! Lower Tangier Sound was somewhat cooler at 82 degrees. This hasn’t lessened the appetite of the fish, however. This past Monday was a scouting day for me and I managed to spot a few schools of breaking bluefish in the vicinity of Sharps Island Light. These were fairly nice fish in the two to four pound range. Right before dark I slipped into the shallows for some popper action and the rockfish were still there with one 30 inch fish brought boatside, along with several more in the 20 – 26 inch range. At one point the water erupted when a large school of rock ambushed a pod of silversides drifting through a shallow water tide rip. What a site to see in four feet of water. The next evening I fished with Matt Zuiderhof and his friend Brian Holt. We pulled away from the ramp in Madison on the Little Choptank at around 2:30 P.M. After a moderate sail up towards Sharps Island Light – all the while searching high and low for any signs of breaking bluefish – we finally found a school that stayed up for awhile. We caught maybe six to ten nice blues up to 4 1/2 pounds. Once hooked, I do believe the blues were out of the water as much as they were in, as they did a tarpon proud with their tail walking theatrics. There were several small stripers mixed in with the blues. Like Monday, we traveled to the shallows for some evening popper fishing. While we managed a few fish late on poppers, the hot ticket tonight was a Storm Wildeye Shad. For the better part of two hours Matt and Brian caught rock after rock, with extended periods of fish on every cast. These were nice fish too, with most in the 20 to 24 inch range. Largest fish tonight was maybe 26 inches and I figure the guys boated over 40 stripers. Sorry no pictures, we were all kind of busy. Friday evening I headed south to Tangier Sound to fish with Ernie Rojas, Rob Allen and George Lenard, all of the CCA’s Northern Virginia Chapter. With a stiff 15 – 20K northerly wind greeting us as we entered the sound, we decided to head to the lee side of some islands and look for clean water. Found what we were looking for and after trying several spots we found some hungry stripers. While not coming in every cast the fish were of decent size, averaging 20 to 25 inches. 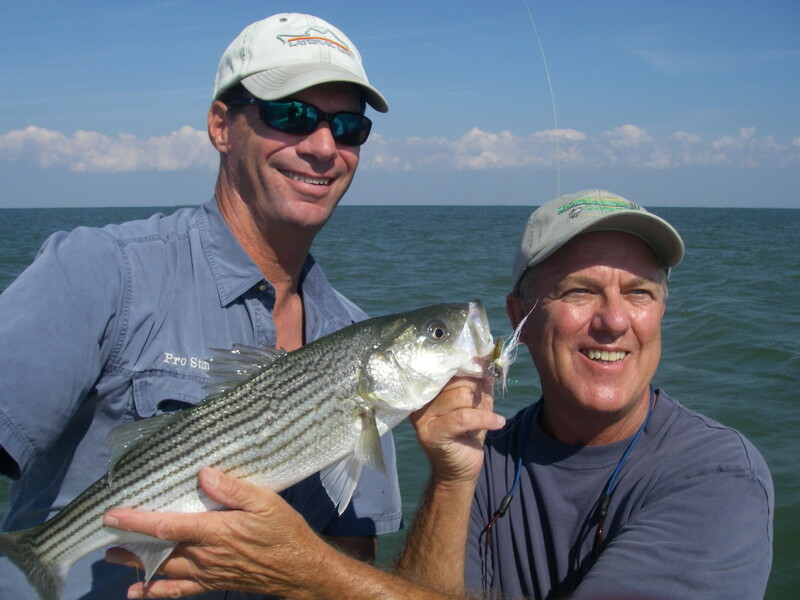 Rob and George were the top rockfish producers, while Ernie added a few nice stripers and also boated three monster croaker to 17 inches. Wish I could get more folks to fish for these hard-fighting cousins to the red drum, they sure do put up a battle. 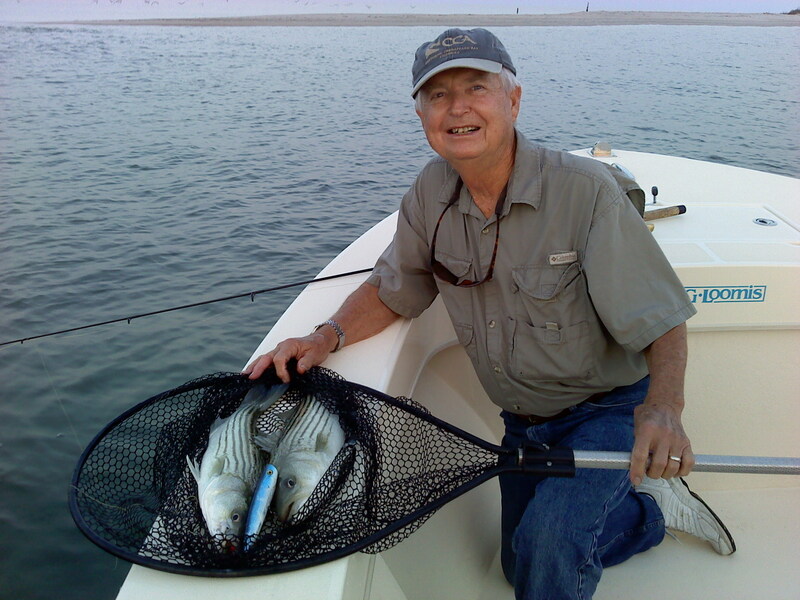 George is the owner of Specialized Baits, and his Li’l Jimy bucktail jig was the top producer. Check out George’s line of custom-tied baits at www.specializedbaits.com, they are true works of art! Saturday morning’s crew was the same as Friday. 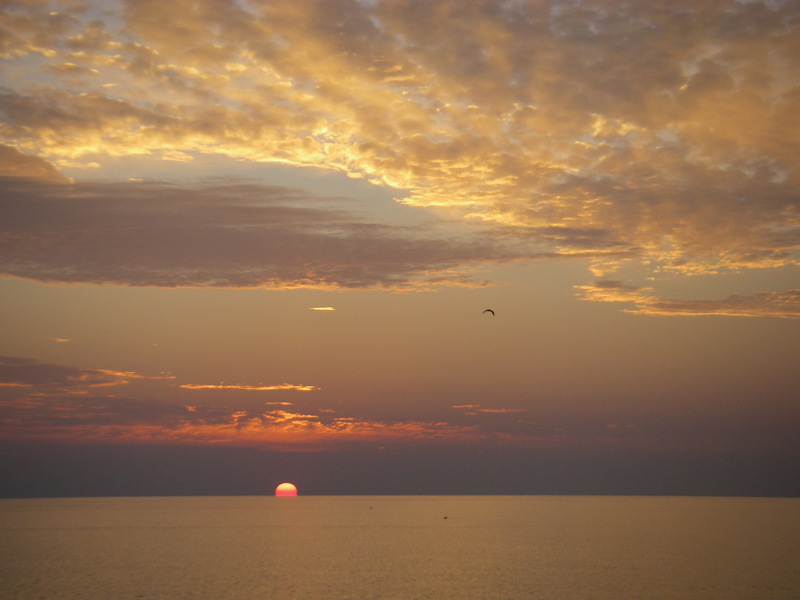 We took in a picture perfect sunrise and calm seas while enroute to the fishing grounds. Beautiful sunrise and calm seas. Photo by Ernie Rojas. With perfect conditions, Saturday was all topwater. 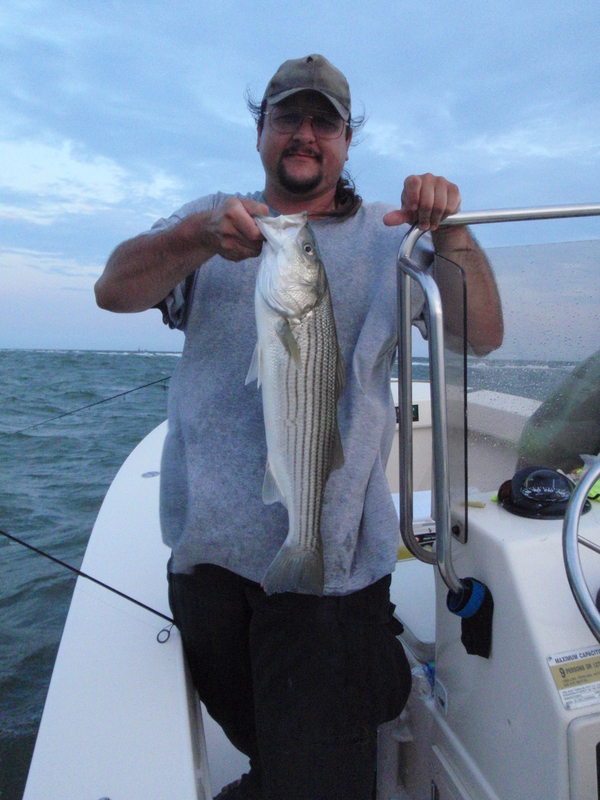 Rob was first to hook-up on a Stillwater Smack-it popper with a nice six pound striper. I believe Rob was also top rod for the day, he had that popper talking to ’em. The rock were smacking the poppers all over the place in just four feet of water until the sun got up too high and the action slowed. George was still able to coax in a few with his Li’l Jimy. We didn’t get any of the 30 inch fish of previous trips, but approximately 12 – 15 rock in the 20 – 26 inch range came aboard during the morning’s action, in addition to those that missed the popper on the first swipe. A brief stint out in the bay near the target ships netted us a handful of blues and that was about it for the day. Decent sized fish on topwater and good friends made the morning a rousing success. Heard a report of some puppy drum (redfish) being caught on bait, so I’ll be looking for them to start coming in the boat along with the rockfish. I’ll keep you posted.